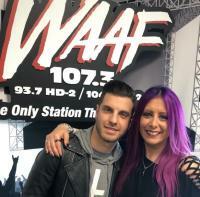 Palisades Rocks NY; Meets Mr. Octane! Rise/ADA Rockers Palisades recently rocked the Playstation Theater in New York City opening for Nothing More and after the show met up with SiriusXM Octane PD Vince Usuriello for the back stage photo op. 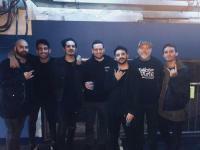 Pictured Left to Right: Palisades band members- Matt Marshall, Aaron Rosa, Xavier Adames, Octane PD Vince Usuriello, Palisades-Louis Micell, ADA SVP David McGilvray, and Palisades Brandon Elgar. The Glorious Sons Rock The Roxy In Hollywood! 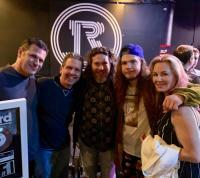 BMG Rockers The Glorious Sons recently headlined a SOLD OUT Roxy Theatre in West Hollywood, CA. After the show the band accepted plaques for their #1 Rock hit S.O.S. (Sawed Off Shotgun). Pictured after the show Left to Right: Nick Attaway (BMG Records), Ken Anthony (All Access Rock Editor), Jave Patterson (KDOT/Reno PD), Brett Emmons (Glorious Sons Lead Singer), Allison Patterson (Jave's wife).